Your wedding day is arguably the most romantic day of your life, and it’s easy to bring that intimacy to your Indianapolis wedding photography session. Begin your photo shoot at Indy’s famed Canal Walk, which twists and turns along three miles of the city’s canal. There are plenty of surprises along the way, including waterfalls, restored 19th century bridges, gardens, and even murals from local artists. You don’t have to hike the entire trail to find amazing backdrops; pop onto the trail at any point and your photographer will be able to stage some great photos. Catch some silhouetted shots of you and your beau walking down the lush pathway, or get a group picture of the couple with their attendants lined up across one of the picturesque bridges. Once you have gotten your fill of the beautiful Canal Walk, it’s time for a ride in one of Indy’s horse-drawn carriages through the city’s historic downtown. Choose from one of the various carriage companies, or make reservations in advance. A ride that clocks in just under half an hour will only set you back around $50. Leave your bridal party behind as you cozy up to each other in the back of the carriage. 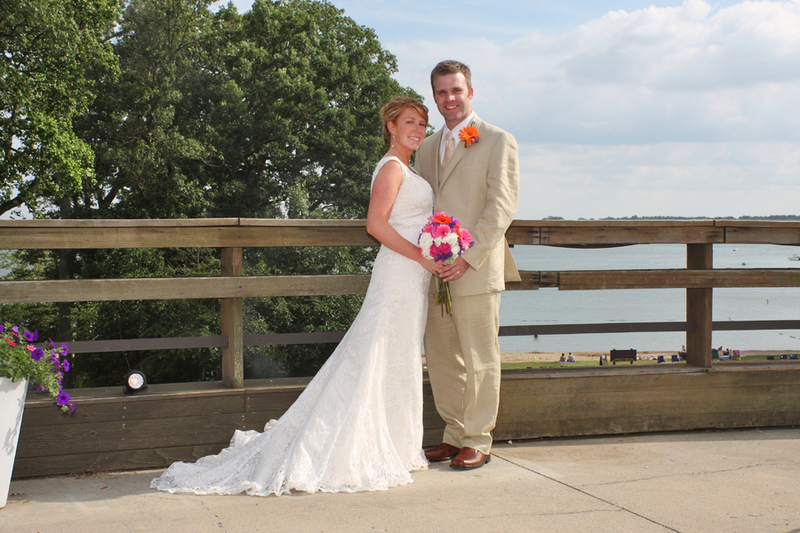 Your wedding photographer can tag along to get some fantastic shots of the bridal couple, the carriage, and the gorgeous Indianapolis backdrop. Tack a ‘Just Married’ sign on the back of the carriage and have your photographer get some pictures of you and your new spouse waving goodbye for the perfect final photo in your album. Indianapolis has been home to some of America’s treasured citizens. Use your Indianapolis wedding photography session to pay homage to two of these great men by visiting their historic, restored homes. First, check out the Benjamin Harrison Presidential Site, former home to the late 19th century American president. The house sits in the once fashionable Old Northside District, on Delaware Street. Built in the Italianate architecture that was popular in the late Victorian era, the deep brick color is a lovely backdrop for your white or ivory dress. The immense white terraces were added by the president later in his life, and they provide a friendly contrast to the building’s starchy frame. Get some pictures in front of the house with you and your bridal party, or have your photographer snap some of the bridal couple leaning over the terrace’s balustrade. Get in your limo and ride to another Italianate styled, photogenic home--the James Whitcomb Riley House in the Lockerbie Square Historic District. The house was once home to the famous eponymous poet. The small porch and green striped awning make for some stunning couple pictures, or you and your bridal party can congregate beneath one of the ancient shady trees out front for more relaxed group images. Once your special day is over and you are looking back on your photos, you will be happy you incorporated these striking brick facades into your album. While Indy is not known for aquatics, there are quite a few opportunities for you’re your honey, and your bridal party to incorporate the Central Canal into your photos in unique ways. For the truly adventurous—who don’t mind getting their dress or tux a little wet—couples and their attendants can rent kayaks and drift along the smooth waters. This probably won’t work for those with puffy dresses, but if your dress is streamlined then hop in and paddle off into the sunset. 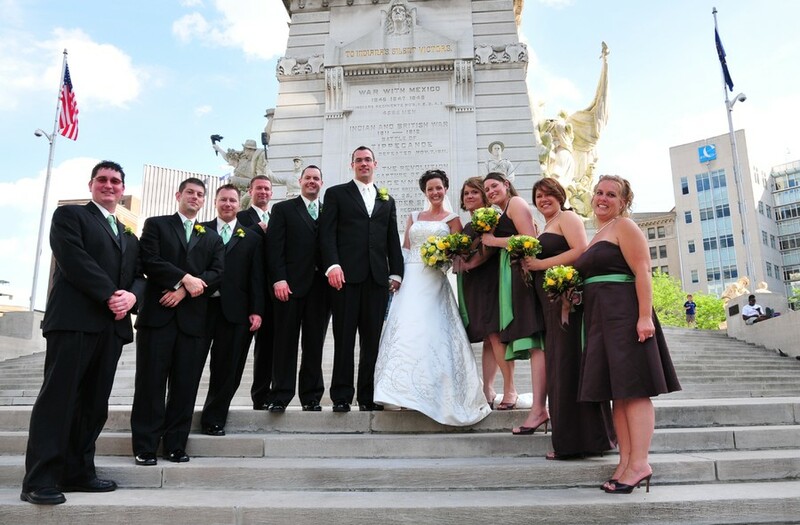 Your Indianapolis wedding photographer will snap some stunning shots of you and your party riding down the waterway with the city buildings sprawling out in front of you. If kayaks aren’t your thing or your dress is too large to fit in one, even without the crinoline, try renting some peddle boats. Peddle slowly down the canal, taking in the beautiful sights of central Indianapolis. Wedding photography looks best when the wedding party is relaxed and enjoying themselves, so don’t push yourself to pose too much for the photographer and you will get some wonderful candid images. If you don’t feel much like peddling, or you want to add another dreamy layer to your canal photos, hitch a ride on one of the city’s adorable gondolas. The gondolier will push you forward down the canal while your wedding photographer catches all of your nuzzles and intimate glances. For those that are less inclined to chance getting their outfits wet or ruined, and that includes those with rented tuxes, you and your group can rent bikes to ride down the Canal Walk instead. You will still get the ethereal water setting without the risk of damaging your clothes. The bride can sit on the groom’s handlebars for a couple of shots, or the whole group can ride down the path in a V formation with the bride and groom at the helm. The laughter and smiles will transport you all to your carefree childhood days of bike riding, making for some entertaining and memorable captured images. Complete your Indianapolis wedding photography shoot with some ice cream (or hot cocoa if it’s winter!) at one of the local downtown eateries. You can finally rest your wary legs and unwind from your long, event-filled day, knowing you have will have amazing pictures to fill your albums.